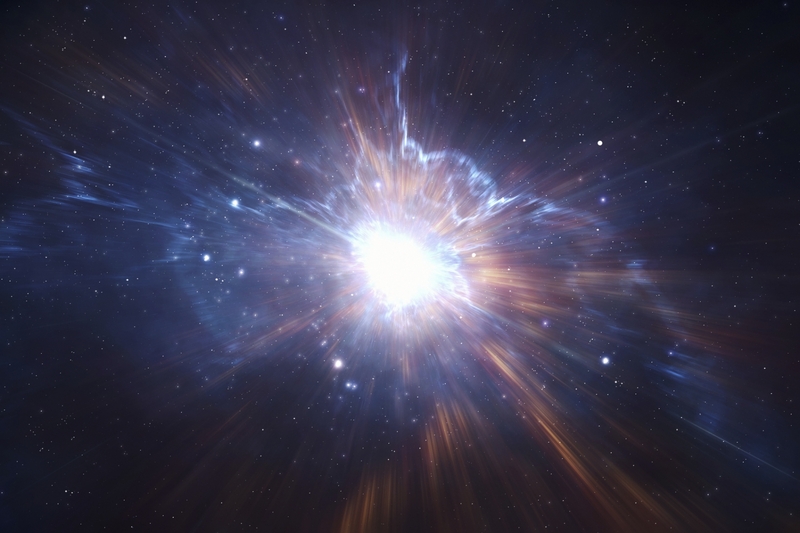 For a few physicists, the Big Bang wasn’t the beginning of the universe. Rather, they say, the universe existed before that point, stretching forever into the past as well as the future. While the universe is expanding today, it was contracting in the time before the Big Bang. In this picture, the Big Bang isn’t so much a bang but a bounce, a moment when a shrinking universe reversed course and began to grow. And according to their theory, the universe could bounce again. Today’s expansion could be followed by collapse in the far future, followed by another bounce. Some physicists have suggested this bouncing could be infinite, reviving a cyclic cosmology first proposed in the 1930s. But how that infinitesimally hot and dense point came to be remains an unanswered question. Bouncing theories could promise to explain the origin of the cosmos. Whether a single bounce or endless bounces, a handful of cosmologists have spent the last couple decades tinkering with these ideas. But to others, bounce theories are simply speculative and controversial, and to some, they’re discredited and wrong. Much of the debate between Big Bang and Big Bounce proponents revolves around the viability of inflation, the mainstream view of how the universe has come to be the way it is today. And although any cosmologist would agree that inflation is, at the very least, incomplete, the vast majority considers it the best model yet. Still, bounce proponents see fundamental flaws in this model. “Inflation’s not doing too well,” says Neil Turok, director of the Perimeter Institute for Theoretical Physics. “It’s had its day. It was useful when it was invented in the early 1980s.” But now, he says, we need a new theory, and that theory could be a bouncing universe. The standard story of inflation goes like this: shortly after the Big Bang, the universe ballooned rapidly—much faster than its normal expansion. This sudden growth was necessary to create the smooth, flat, and uniform universe that scientists see today. Cosmologists first developed inflation in the early 1980s, before balloon-borne experiments and satellites returned increasingly precise data on the state of the early universe. These observations measured the leftover radiation from the Big Bang, a ubiquitous glow called the cosmic microwave background [CMB]. The radiation is patchily distributed, with some spots hotter and cooler than others, an auspicious result since the exact nature of this patchiness was precisely what inflation predicted. Inflation also predicted the mass density of the universe, also measured from the cosmic microwave background. “We’ve measured the mass density to better than a half percent accuracy, and it agrees perfectly with what inflation predicts—which is just gorgeous,” says Alan Guth, a physicist at MIT and the first who proposed inflation in 1980. Still, while these successes have been more than encouraging for inflation, the evidence has yet to convince everyone. One prediction that might quell some dissent would be the detection of primordial gravitational waves, ripples in the fabric of space and time that originated from fluctuations of the gravity field in the early universe. It almost happened: In March 2014, the BICEP2 experiment at the South Pole claimed to have seen these gravitational waves. But that heralded discovery vanished when astronomers realized the signal could have been entirely due to dust in the galaxy. Gravitational Wave Background from BICEP 2, quickly discredited. Inflation is not without its theoretical issues either. Some critics say that inflation requires initial conditions that are too specialized and contrived to be realistic. To get inflation started, the early universe had to be just right. Another point of contention is that inflation could imply the existence of an infinite number of universes. In the early 1980s, physicists discovered that inflation goes on forever, stopping only in some regions of space. But in between these pockets, inflation continues, expanding faster than the speed of light. These bubbles are thus closed off from each other, effectively becoming isolated universes with their own laws of physics. According to this theory, we live in one of these bubbles. Even ardent supporters of inflation would agree the theory is incomplete. It doesn’t say anything about the moment of the Big Bang itself, for example, when the known laws of physics break down at what’s called a singularity. What inflation still lacks is a deeper foundation. Physicists have tried connecting inflation with string theory—the best candidate for a so-called theory of everything. But it’s still a work in progress. “With inflation, we basically add something by hand and we say it works, but we don’t have a more theoretical understanding of where it could come from,” says Steffen Gielen of the Perimeter Institute, who works with Turok on bouncing models. The suggestion that the Big Bang wasn’t the absolute beginning originates from the first half of the 20th century, when physicists proposed a cyclic universe. But at the time, no one understood the details for how the universe could enter and emerge from each bounce. Todays’ physicists still have their work cut out for them, but now they have all the tools of modern particle physics and string theory. In 1992, Maurizio Gasperini and Gabriele Veneziano first used these modern ideas to revisit a pre-Big-Bang universe. Ten years later, Turok and Paul Steinhardt, a physicist at Princeton University and one of inflation’s pioneers turned critic, expanded on that work. They have since become two of the most outspoken detractors of inflation and proponents of a bouncing universe. A bouncing universe, they argue, could produce the cosmos we see today—but without inflation. The universe doesn’t need a period of super-expansion to reach the smooth, flat state we see today; it can do so while contracting. And because every corner of a shrinking universe would have been in contact with one another, the whole cosmos could settle into a uniform temperature—again, just as we see it today. Because so much of the early universe is unknown, theories of cosmology can vary widely. Inflation, for instance, isn’t one particular theory but a class of models, each a bit different in detail. Likewise, physicists have theorized many ways for how a universe can bounce. In one case, dubbed a matter bounce, the universe only bounces once. The collapse into the bounce is like a reverse-order Big Bang. Another version, called an ekpyrotic model, can be cyclical, with contraction followed by expansion followed by contraction, and so on. The anamorphic universe might be similarly cyclical. Pretty much all models require some sort of new physics. The differences between these models depend on the details, whether it’s new theories or exotic types of matter that halt the inertia of collapse and guide the universe through the bounce. Figuring out what happens at the bounce poses a big challenge, because that point is where the laws of physics fail, just as they do at the start of an inflationary universe. At the bounce, the universe collapses into a singularity, in which Einstein’s theory of gravity, general relativity, breaks down. Relativity isn’t currently compatible with quantum mechanics, which is needed at the small scales of the singularity. To unite the two, physicists have been searching for a theory of quantum gravity, which doesn’t yet exist. Over the past year, though, physicists have claimed modest progress on how to handle the singularity. Turok and Gielen have outlined how a simplified, toy model of a universe could undergo a quantum bounce. A bouncing universe containing only radiation—not unlike the radiation-dominated cosmos at the Big Bang—could cross the singularity in a way like quantum tunneling: According to quantum mechanics, a particle can spontaneously appear on the other side of a barrier that would otherwise be impenetrable in non-quantum physics. A collapsing universe can act like a particle and tunnel through the barrier-like singularity, appearing on the other side as the expanding universe we know today—and evading the singularity’s problems. Meanwhile, Steinhardt and Anna Ijjas of Princeton University have proposed a way the universe could bounce without evoking quantum mechanics. They’ve shown that some exotic, negative energy could prevent a universe from collapsing into a singularity in the first place. By avoiding a singularity, the universe never gets small enough for quantum mechanics to come into play, so you don’t need quantum gravity. The universe then proceeds to expand. But while these two proposals might be a small advance, neither marks a radical leap from what’s been done before, Brandenberger says. We’re still far from solving the problem of the singularity. “If we solve the singularity problem by evoking exotic matter, the question is just twisted,” he says. In other words, instead of explaining the singularity, you now have to explain the exotic matter. But it’s still too early to judge, Turok says. The theories aren’t mature enough to be testable yet. Eventually, though, models could start making predictions. Future, more detailed measurements of the cosmic microwave background might support a particular model of inflation or a bouncing universe. Perhaps the most promising evidence would come in the form of primordial gravitational waves, which are about the best indicators of what happened in the moments after the Big Bang (or bounce). Depending on what these waves look like, researchers can start ruling out models of both bouncing universes and inflation. While the BICEP2 findings in 2014 were a false alarm, researchers hope other instruments will succeed, including its successor, BICEP3. The Atacama B-mode Search is now operating in the Atacama Desert in Chile, and researchers are planning future experiments with names such as the Primordial Inflation Polarization Explorer, Qubic, and Polarbear. In the end, however, it may not simply come down to an either-or choice between bouncing models or inflation, even though proponents of bouncing models sell their idea as an alternative. “What they’re doing is much more closely allied to inflation than they would have you think,” says Andrew Liddle, a cosmologist at the University of Edinburgh. “I don’t think it’s that radical of a departure.” Many of the mathematical tools used in bouncing models are similar to those used for inflation, he says. And when you apply observations like the cosmic microwave background, both bouncing models and inflation give similar results. Still, the debates between bounce proponents and the most outspoken inflation supporters can get contentious, each somewhat dismissive of the other side. The conflict is a reminder that science—and perhaps theoretical physics, in particular—is ultimately a human endeavor, filled with egos and subjectivity. Legacies and Nobel Prizes could be at stake. “In the absence of data, you’re welcome to your opinion—opinion is all you have,” Carroll says. “All of these ideas have significant challenges and question marks next to them.” While a problem may be a deal-breaker for one person, it’s only a minor stumbling block to another. When blazing a new trail, the right path is often subjective.